A 3D printed Twitter logo is seen in front of a displayed cyber code in this illustration taken March 22, 2016. “Half of jihad is media,” Islamic State propagandists used to stress to activists and foreign recruits, urging them to win hearts and minds in cyber space. 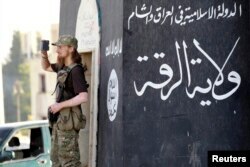 Since the latter part of 2015, there has been a noticeable drop in the presence online of IS members based in Syria and Iraq, including some of the most celebrated fixtures in the terror group’s propaganda campaign, say researchers with an online monitoring group. “IS members were more visible and vocal across a plethora of social media platforms than they are today,” according to a study by the Middle East Media Research Institute, MEMRI, which monitors jihadist activity on the Web. That is particularly the case for female IS members at the forefront of the terror group’s effort to wage psychological warfare, lure Western women to the marriage beds of IS ‘holy warriors’ and market the group online, posting personal photos on social media accounts and offering a stylized glimpse of life in the self-proclaimed caliphate. Some notorious foreign jihadist women propagandists have faded from the online scene, including Aqsa Mahmood, who was brought up in a prosperous Glasgow suburb and attended an exclusive Scottish girls’ school. Mahmood fled her successful family in Scotland to join IS in northern Syria. Now 21 years old, she emerged quickly as a fixture in the online jihadist campaign to recruit Western girls, telling them their main role in the Islamic revolution would be matrimony and childbearing, rather than martyrdom. She used the Twitter handle Umm Layth and posted a blog to try to persuade would-be “sisters” in Europe and the United States to travel to the Middle East to help IS establish its extremist vision of a militant Islamic utopia. She appears to have posted nothing online since mid-2015. Another once-prominent online voice was Australian teen Umm ("mother of") Istishhadi ("martyrdom seeker, aka suicide bomber"). She was a prolific tweeter who returned immediately after each suspension of her Twitter account. Another woman who has faded from online view is a Bosnian IS member calling herself Sumaya Umm Dojana. She contributed daily to her Instagram account with videos featuring her singing and showing her heavily made up eyes in her burqa. Gory threats and organized hashtag campaigns by Raqqa-based IS women have been replaced by more disguised messaging from supporters and sympathizers outside Syria and Iraq. “Some supporters are trying to disguise their agenda by appearing to comment on current events from Western media sources,” say MEMRI analysts. “This may be partially an attempt to appear more sophisticated,” they say. Only a handful of Western women inside the caliphate appears to be active online now. MEMRI argues several factors may be behind the online silence of women IS members. They include the possibility that some women may have been killed in U.S.-led coalition and Russian airstrikes, or that IS has imposed restrictions on Internet use for security reasons due to concerns about dissent or betrayal. In 2015, IS banned Wi-Fi usage in private homes, restricting access only to Internet cafes overseen by the jihadists. Some Internet cafes were closed down too. This was done, according to activists with the anti-IS network Raqqa Is Being Slaughtered Silently, to reduce the opportunities for public dissent and complaint by IS members, and to hinder political opponents from supplying information to journalists outside Syria. Analysts cite the killing of British hacker Junaid Hussain in a British drone strike last August in Raqqa. It was reported by The Times of London his online activity helped British and U.S. intelligence agencies pinpoint his location. In February, U.S. Defense Secretary Ash Carter said the National Security Agency and the Pentagon were pursuing a cyber war against Islamic State. A month earlier, the widow of an IS fighter voiced open criticism of the terror group's leaders, complaining about the treatment of the widows and the families of dead fighters. Her online protest letter was circulated widely on pro-IS social media sites.